Women play a crucial role within pastoralist societies not just as livestock producers, income generators, and caregivers but also as key organizers and keepers of local knowledge. They are integral to maintaining pastoralist community life and identity. Yet, they remain vulnerable and must constantly negotiate their position within their households, communities and otherwise. Ensuring access to natural resources and economic opportunities is key to empowering pastoralist women. 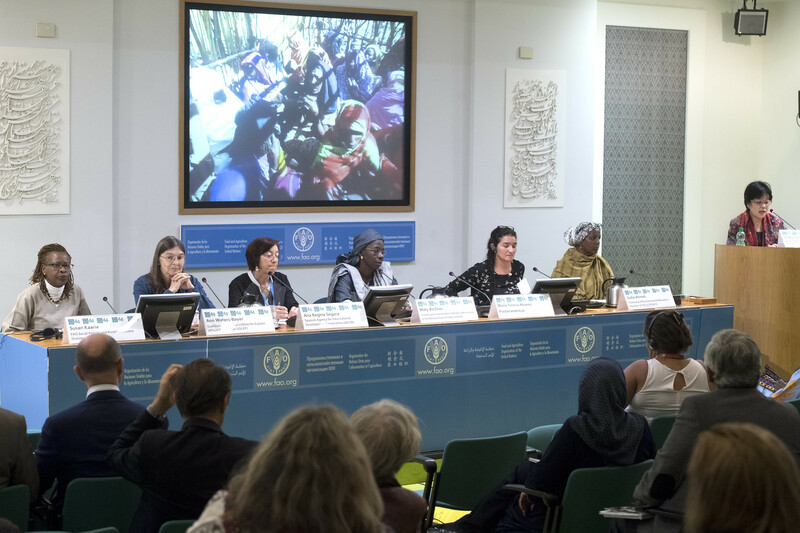 This was the key message of an all-women panel that spoke at an event titled “Women’s empowerment for better resilience in pastoralist communities.” Organized by FAO’s Pastoralist Knowledge Hub, the event took place on October 12, 2017, on the sidelines of the 44th meeting of the Committee on World Food Security (CFS44). While local and customary resource management offered some protection to women, modern statutory tenure systems risk the loss of women’s control over resources as pointed out by Ann Waters-Bayer from the core team of the Coalition of European Lobbies for Eastern African Pastoralism (CELEP). She offered some steps that civil society organizations could take to help strengthen pastoralist women’s access to resources, such as supporting women’s groups in claiming their rights, assessing if laws and policies are responsive to the needs of both men and women, and supporting appropriate education for pastoralist girls and women. National governments can play an important role in providing security to pastoralist women. Ana-Regina Segura from the Spanish Agency for International Development Cooperation (AECID) discussed how countries could support pastoralism. She gave the example of the Spanish vias pecuarias or livestock corridors that allow for the seasonal mobility of pastoralist herds. By mainstreaming gender across all their policies, AECID ensures that women have equal representation in terms of livelihood and resource rights. While access to natural resources is crucial, pastoral women must also have access to credit to develop pastoralist activities. “It is only when women have control over financial resources that they can influence decision making,” said Sadia Ahmed, the country representative for Somalia for the Pastoral and Environmental Network in the Horn of Africa (PENHA).